Through Andrew and Terry I realized that there are actions that emerge from an awakened state of Love and non-resistance through, what Cohen calls, the authentic (versus egoic) self. These creative evolutionary impulses push into “what could be,” or “the adjacent possible”, such as an Integral Love Relationship. Evolution generally means the emergence of ever larger structures of complexity and order, arising out of a sea of disorder (entropy) with multiple potentials and much uncertainty. In other words, evolution is a beautiful and messy process–just as we see in the many facets of our human love relationships. People who push into these untapped potentials (or adjacent possibilities) are called “Evolutionaries”. You may be one of them in your field of spirituality, art, education, business, philosophy, medicine, community building, psychology, technology, law, politics, activism, etc., AND in your love relationship(s). In the next 12 newsletters I plan to comment on each of the 12 Core Values of Integral Relationship Evolutionaries below that I suggested a few months ago and invite you to discuss them on facebook so that we can refine them based on your personal experience. I hope that you will join us. 1. We choose to love, instead of something that happens to us or that we attract. 2. 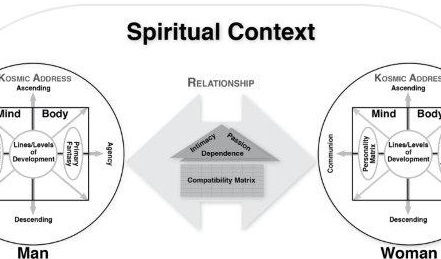 We see the depth of our heart and soul connection as well as the level of humility and devotion to our relationship as an indicator of our psychological health and spiritual realization. 3. We transcend our primary fantasy and base our relationship in Being values, versus material, sexual, or emotional neediness. 4. We use our relationship for ongoing mutual learning, healing, growth and awakening towards the capacity to love unconditionally. 5. We hold an evolutionary perspective and have reached or strive towards an integral, transpersonal or higher level of consciousness. 6. We continually develop, balance and harmonize our healthy feminine and masculine polarities and meet each other as opposites and equals to create synergy at the level of all the seven chakras. 7. We share a purpose for our relationship which is larger than either individual and is offered in service for the greatest good of the largest number of people. 8. 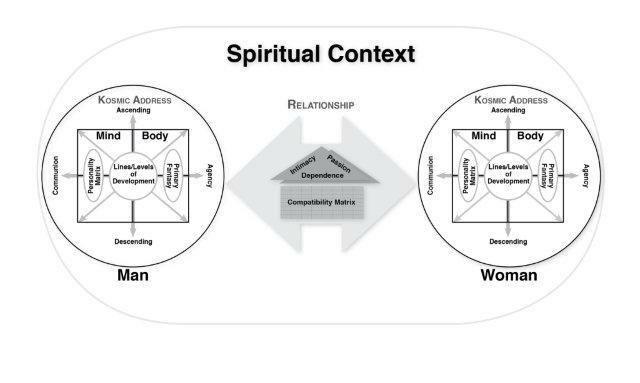 We have an Integral Life Practice (ILP) with modules for the health of our body, mind, spirit/soul, and shadow, as well as ethics, sexuality, work, emotions, and relationships. 9. We make an explicit agreement to tell/listen-to each other’s truths without the need for validation or acceptance from our partner, and to own our emotional reactions to our partner’s reality. 10. We set and respect each other’s healthy boundaries. 11. We share material resources and pursue an environmentally and socially responsible lifestyle. 12. We engage in sacred/tantric sexuality and practice monogamy out of choice instead of fear.